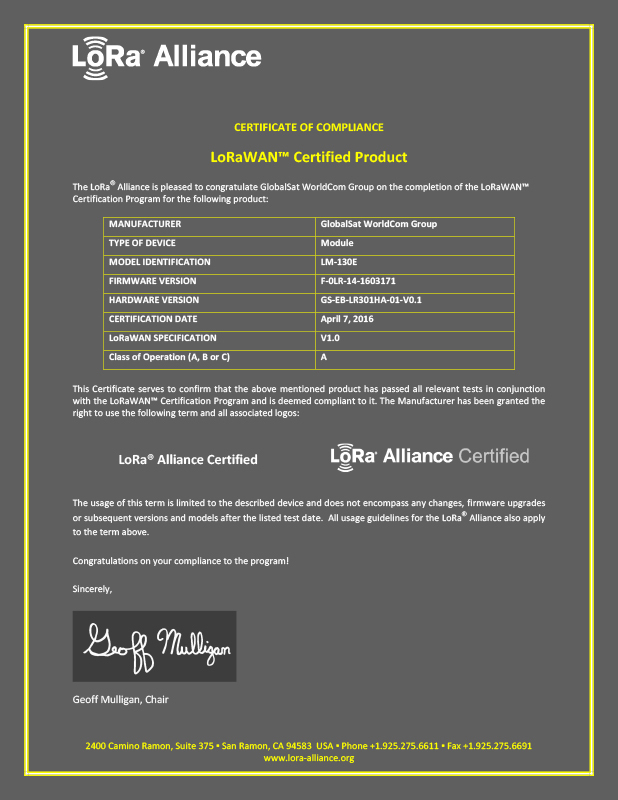 GlobalSat LM-130E LoRa Module obtains LoRaWAN certification and becomes the 1st certified module from Asia - GlobalSat WorldCom Corp.
About Globalsat WorldCom Corp:Established in 2000, is one of the major suppliers of GPS, electronic and communication applications in Asia. The company went public in October 2006 at Taiwan stock market. In the past decade, GlobalSat has delivered GPS Tracking System (3G/GSM/GPRS with GPS/A-GPS), wearable and bike mount GPS Personal Training Devices, GPS Engine Boards/Modules, GPS receiver and now expanding its product line into healthcare and IoT market. Globalsat provides customization services of electronic designs, system integration and software development to meet customer specific needs.